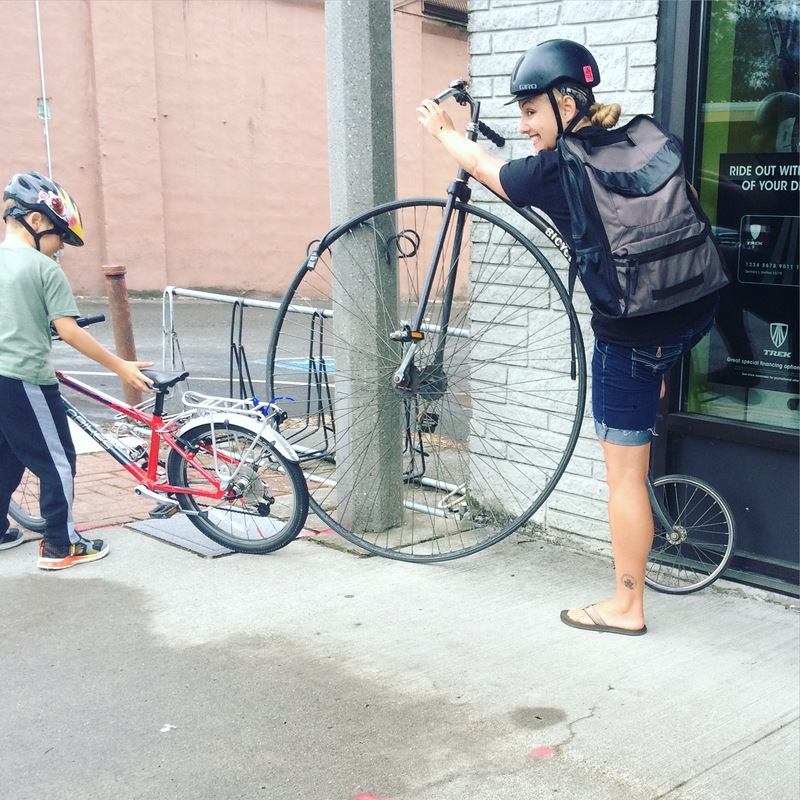 We’re in a fun place where the kids are strong enough and predictable enough to ride their own bikes a lot more than ever before. Also, they’re a lot heavier than they were last summer and it’s a treat to offload them! 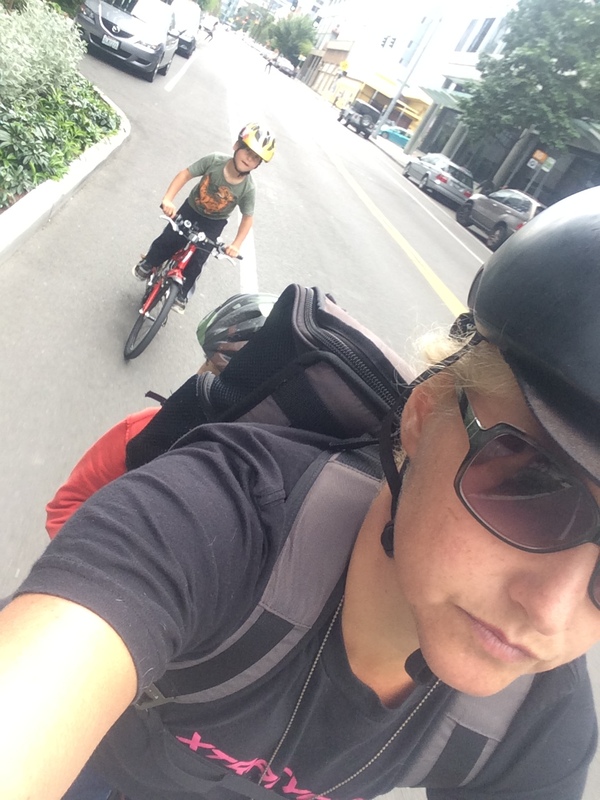 I still take the Big Dummy when we go out on separate bikes because I like to be able to carry one of both of them (and their bikes) should they get tired, injured, grumpy, hungry, etc etc etc. We needed camp stove fuel from REI so this seemed a good opportunity to ride somewhere new with three bikes…though it was probably really based on my not wanting to carry them up the a big hill on the Big Dummy and not being ready to lock the tandem up for an REI-visit amount of time. 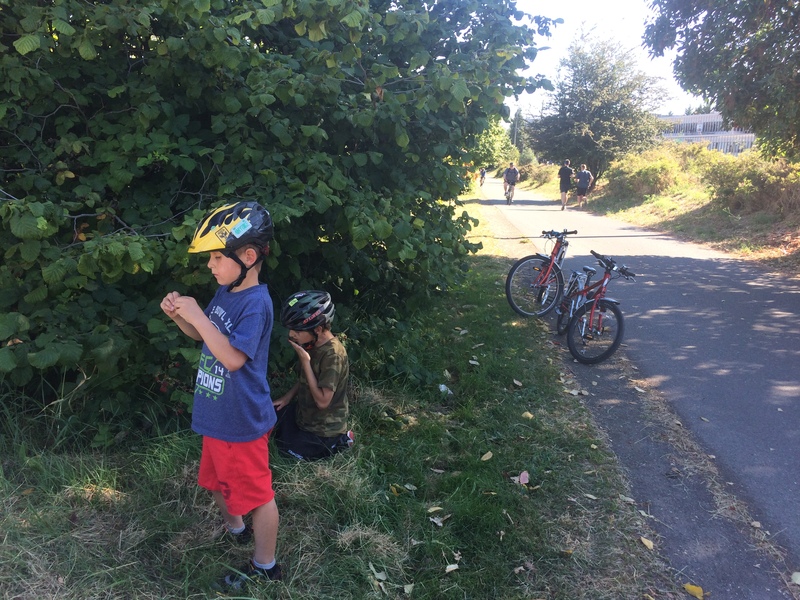 I should have plotted our route carefully ahead of time because my kid-riding-separately routes are generally pretty different from my normal routes (which also differ if I’m carrying kids or not and if I’m on an empty cargo bike or regular bike), but I mentioned the I-5 Colonnade Mountain Bike Park when I presented them with the plan and they agreed that riding their own bikes was a terrific idea so I couldn’t turn back! We took the route I would take to REI were they not riding solo (which is the route I would take with them riding solo to the Colonnade, but not the route I would take with them all the way to REI): over the University Bridge and along Eastlake a few blocks before climbing one block to a quieter street and crossing under the freeway via the I-5 Colonnade and then crossing back over the freeway on Lakeview. I still have trouble wrapping my head around the idea of climbing higher than need be just to go back downhill, but the route is quieter and the hill is less steep. Here’s my Strava recording of our route. Getting to the Colonnade worked well. 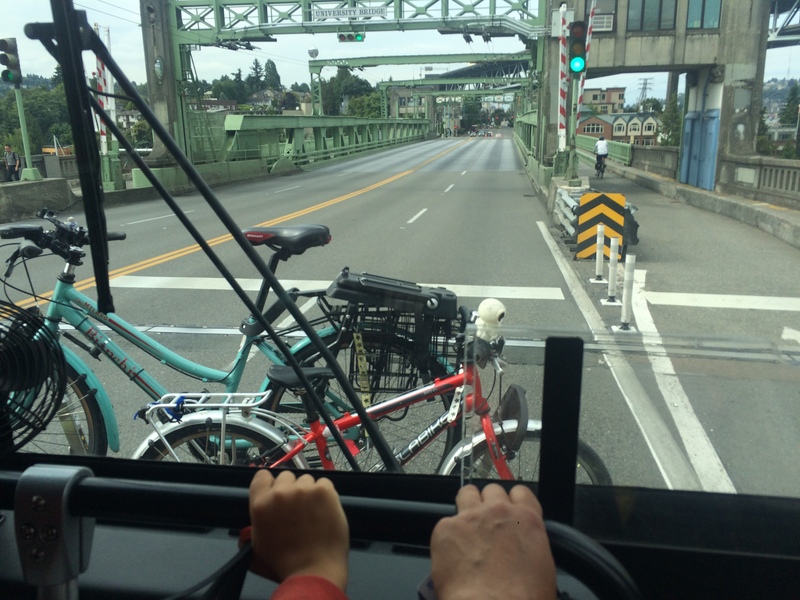 We took the sidewalk for bits–uphill on 40th until we met Roosevelt to cross the University Bridge and then again once Eastlake grew a parking lane. 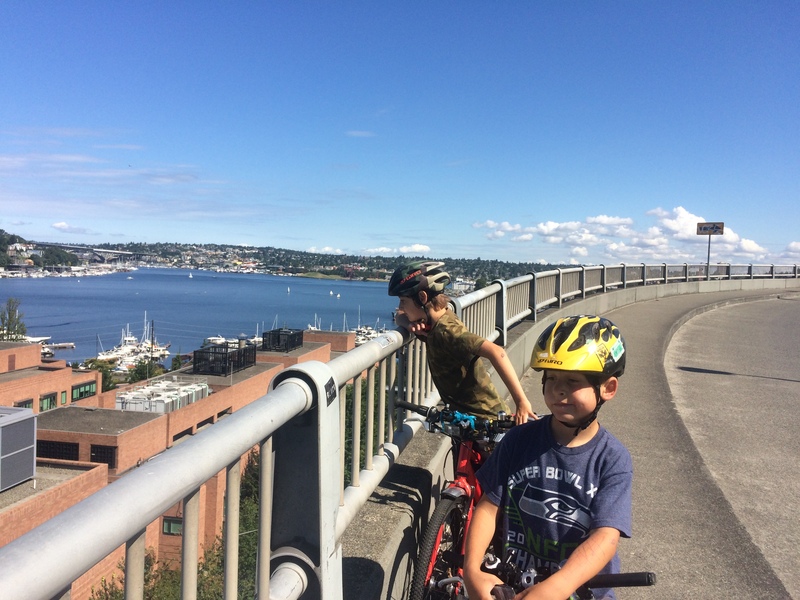 We took a breather at the Colonnade…or rather, I took a breather while the kids ran around the mountain bike park. At this point I realized I had no idea if Lakeview had a sidewalk and if it did, was there one on both sides of the street? 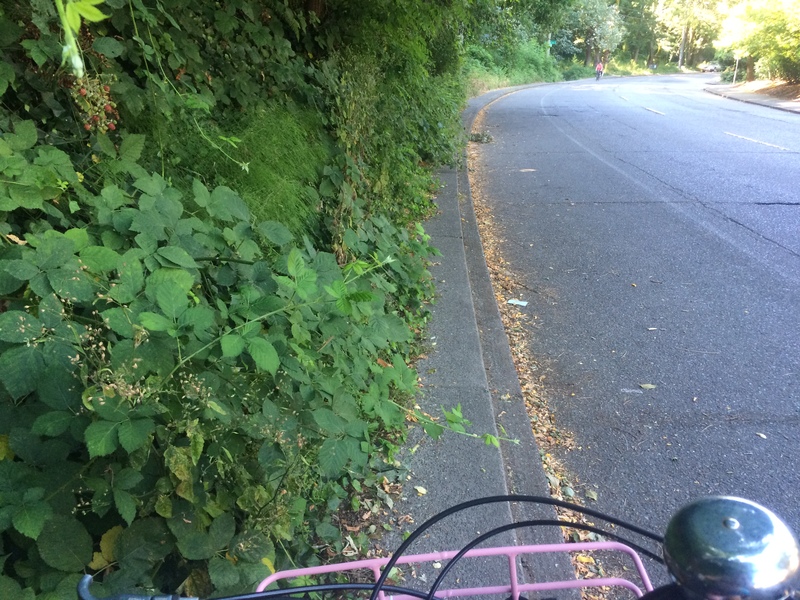 I saw a bit of sidewalk, but thought it didn’t go all the way through on the west side so I had us ride on the east side (towards traffic, not generally the side one should bike on on the sidewalk) because I didn’t want them to ride uphill on the fast arterial with just a sharrow. 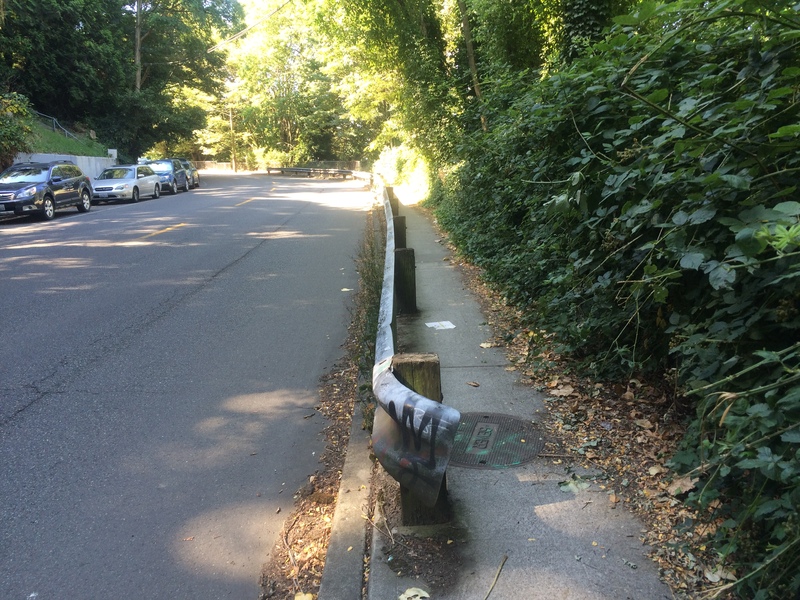 But we were soon blocked by blackberry brambles (note: obviously this is a problem unique to this time of year). And the sidewalk does indeed go all the way through on both sides of the street so we waited a long while for an opening to cross (nope, few people driving on fast streets wait for even little kid street crossers) and crossed back over where there were still lots of blackberry bushes, but the overgrowth wasn’t quite as bad. We stuck to the sidewalk for the Lakeview freeway flyover. Terrific view from up there! 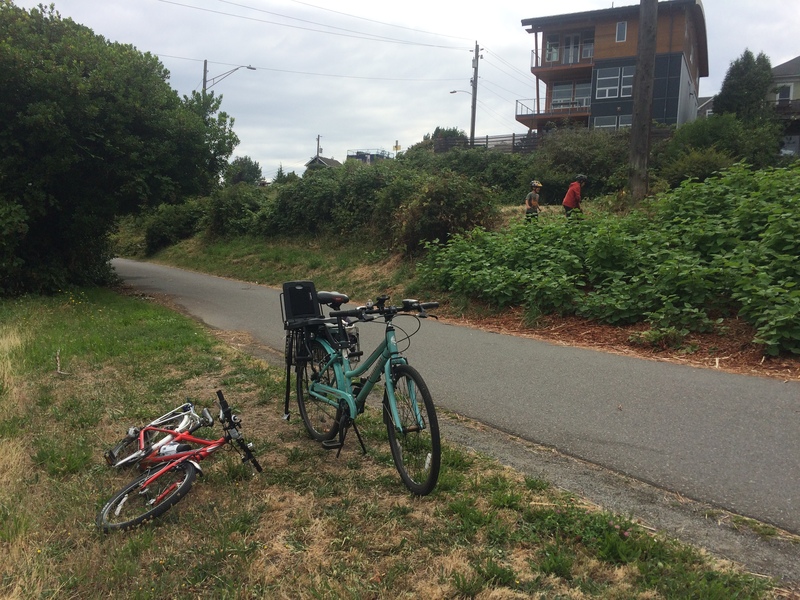 And after a couple more blocks of Eastlake sidewalk we were safely at REI. 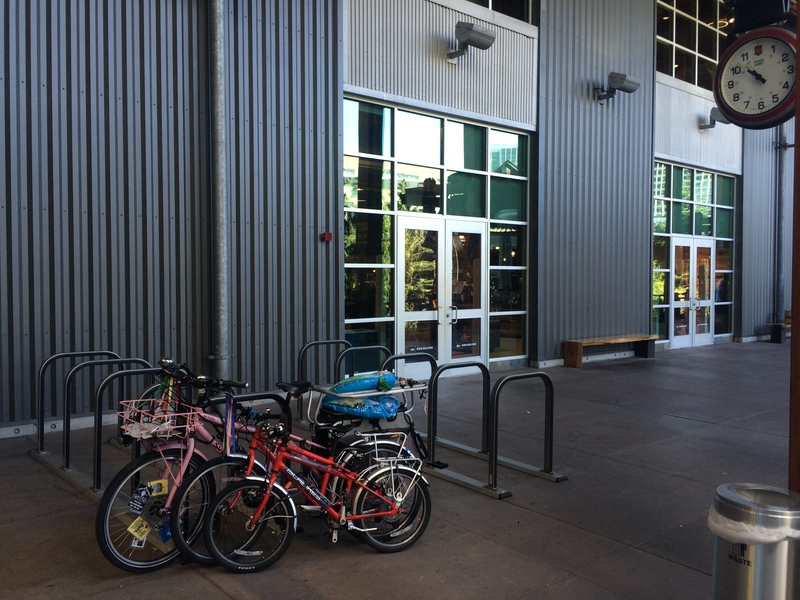 The bike parking is perfectly fine, by the way, I’m just always nervous locking up the newest bike in the fleet. 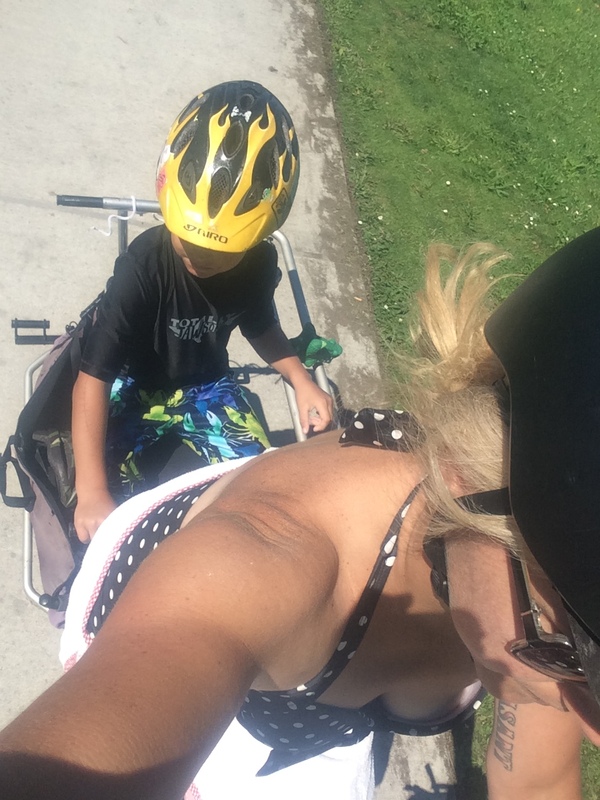 I really do want to take the tandem + trailer bike out more for normal things because we usually just ride it for bike camping and it’s SO HEAVY and I’d love to enjoy it in a svelter situation. 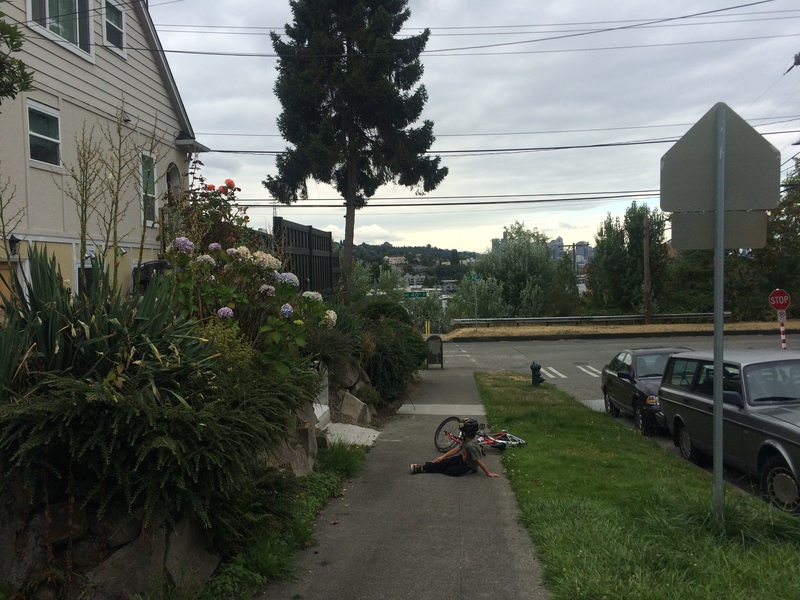 I don’t have a favorite route from REI to South Lake Union and take slightly different routes each time. 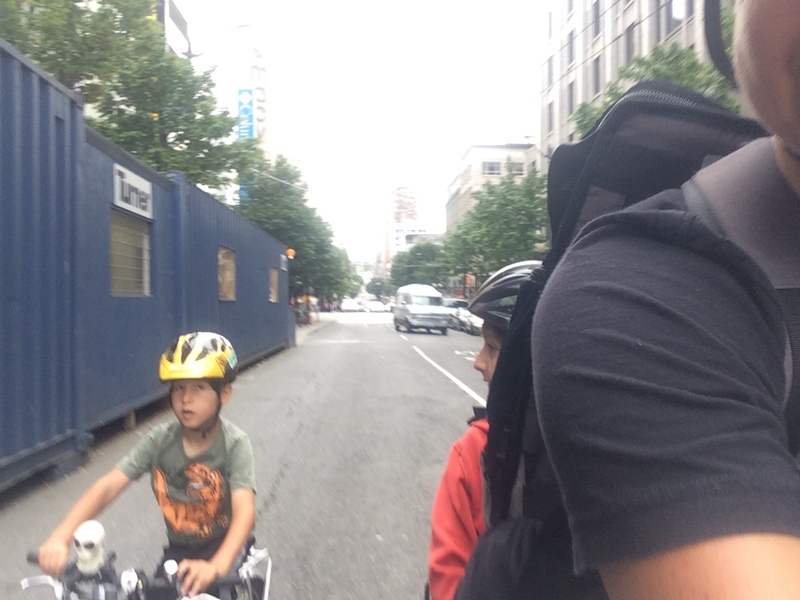 This time, our route was dictated by riding past an exciting-looking construction site (big hole!) and then needing to detour around a different construction site road closure. 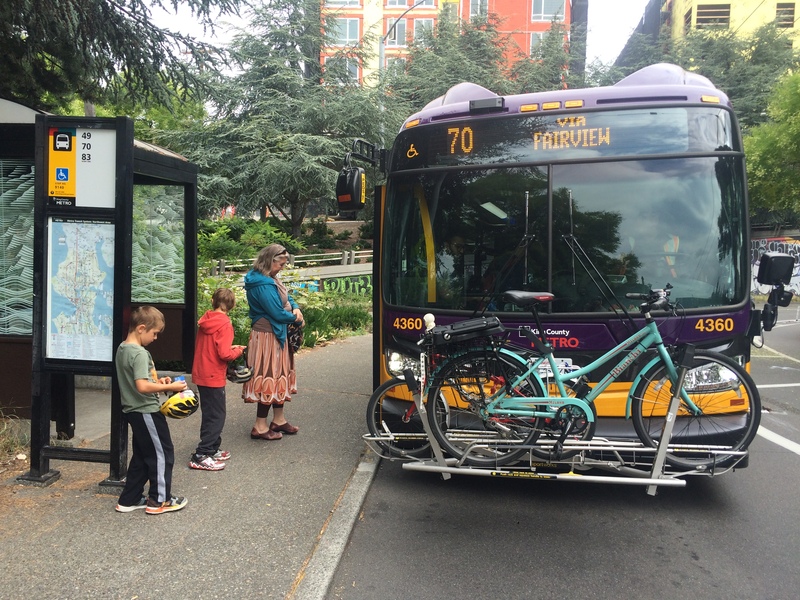 Solo-riding kids are also useful for popping up on the sidewalk to push beg buttons! Even quicker than having passenger kids hop off the Big Dummy deck to run over and push the button and run back. Now even though I didn’t end up having to carry either kid at any point during our voyage to REI, the Big Dummy came in handy while we were hanging out at the Lake Union Park beach: I was able to quickly ferry a wet barefoot kid to the potty at MOHAI. 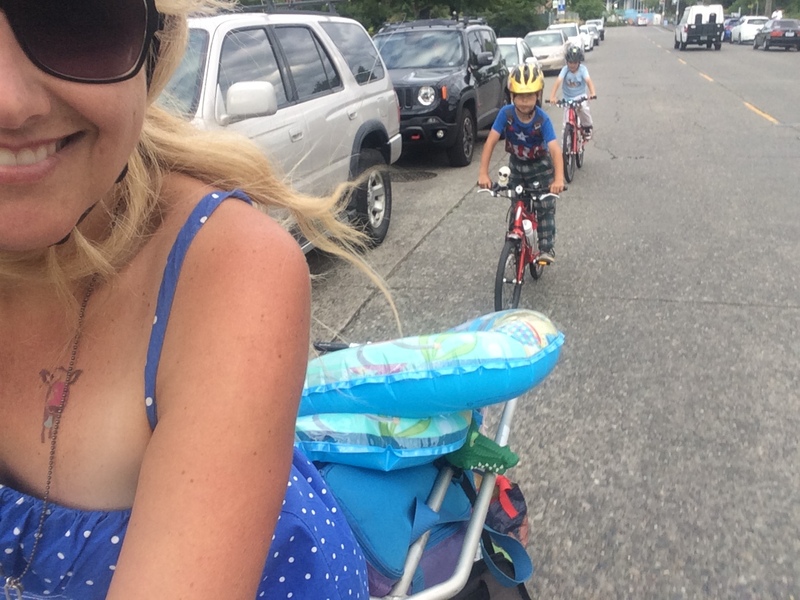 I’m not sure how soon I’ll switch to riding a regular bike rather than the cargo bike. Probably when I can’t keep up with them on my heavy bike. I can keep up with my nine-year old, but not my six-year old. Then we took our familiar route home. 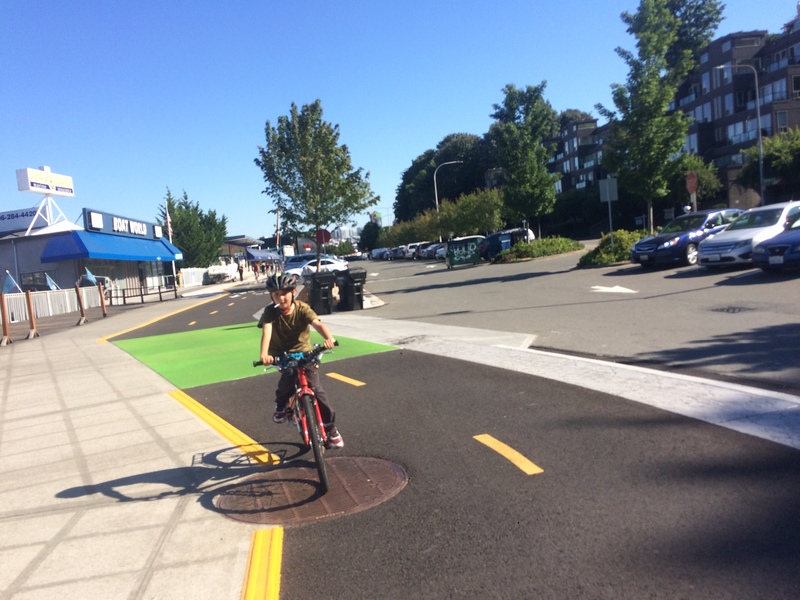 The Westlake Cycletrack is a bit more completed than last time! 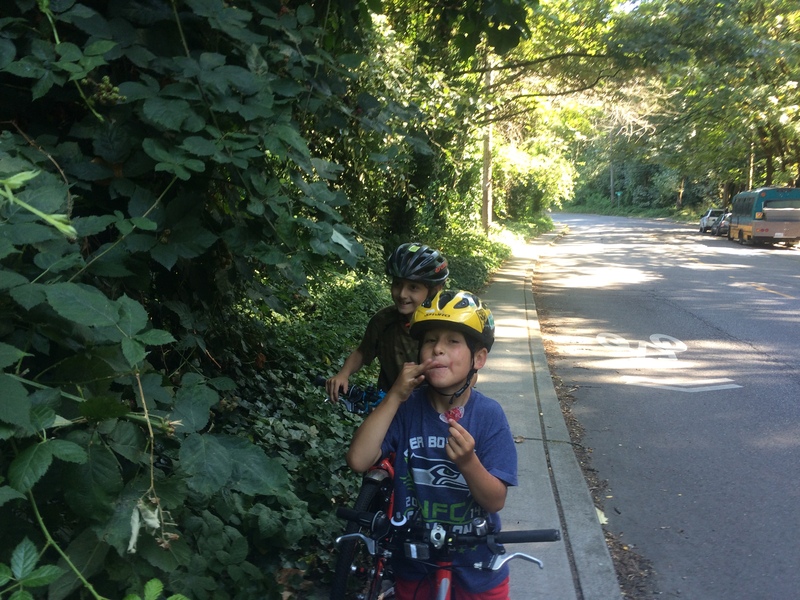 And, of course, there was one last blackberry stop because no prior agreement about having already stopped three times for blackberries and a promise to go picking first thing in the morning will make a stop on the homestretch unnecessary apparently. 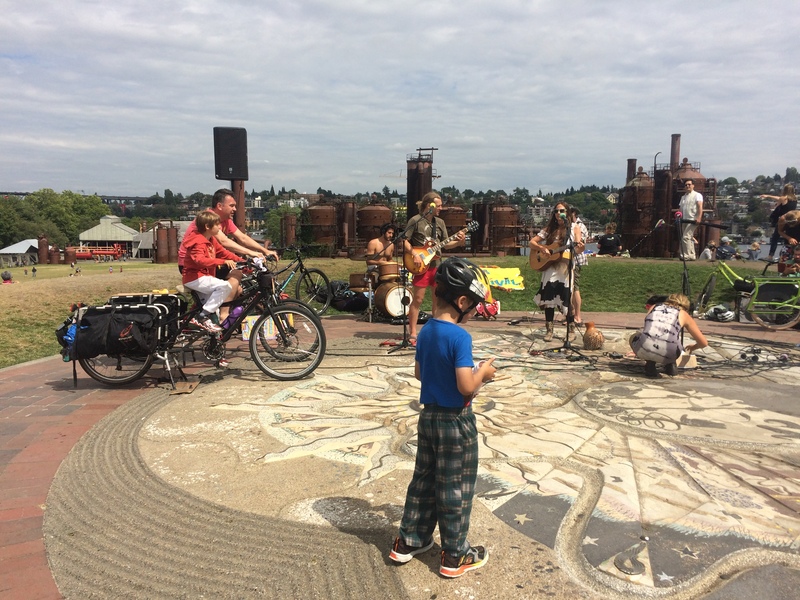 The Pleasant Revolution Biketopia Music Festival special show at Gas Works Park! 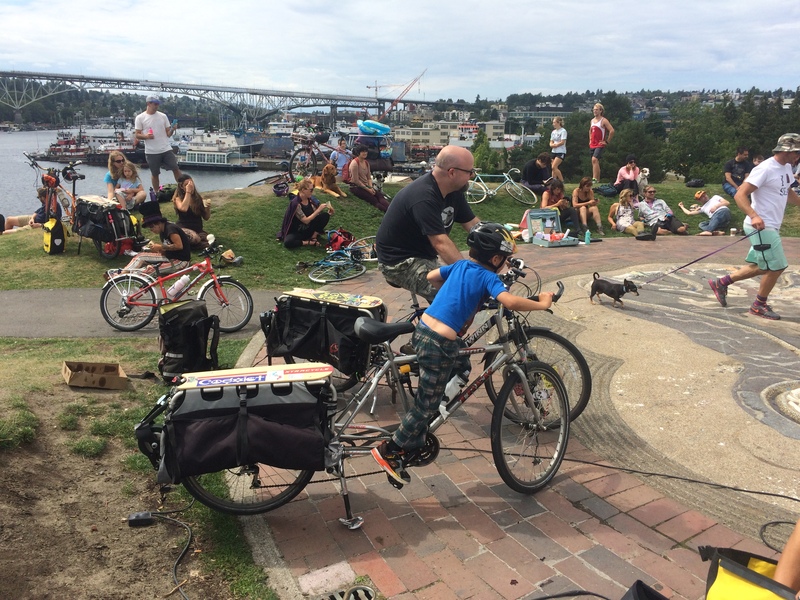 We had the most magical day yesterday, watching and participating in the Pleasant Revolution Biketopia Music Festival! I’ve heard of the Pleasant Revolution before, but never seen them and was sad to think I’d miss them during this visit due to late shows and early bedtimes Friday and Saturday nights and a too-far-from-home show on Sunday. But as luck would have it they played a surprise show as part of Bingo or Bust Alleycat put on by Bicycle Benefits to kick off Seattle’s first Bike Bingo six-week event (I have $2 cards benefiting Familybike Seattle if you still need one!). 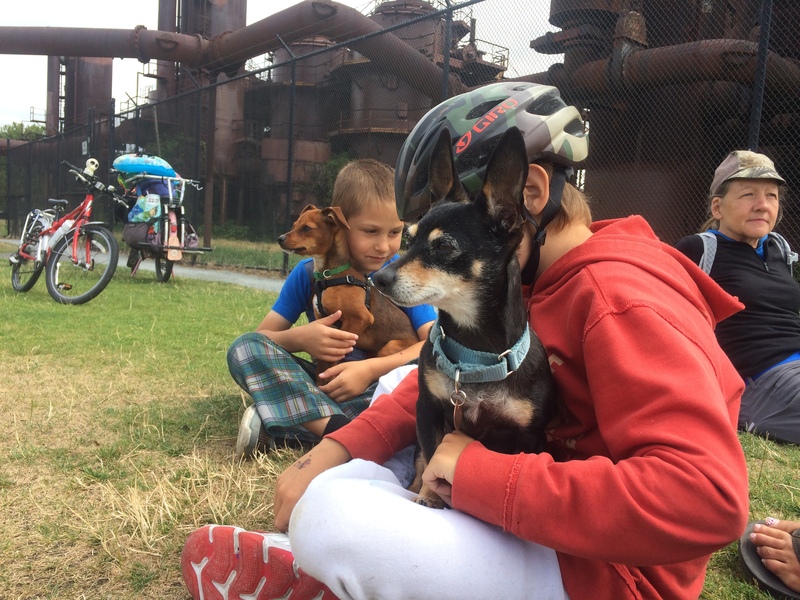 We were lucky to know about the surprise show ahead of time so even though we didn’t make it down to Gas Works Park early enough to cheer on the alleycat racers, we headed down a bit later for a doggie playdate and hang out until the show started. The show and the bikes were amazing! I knew ahead of time that it’s all pedal powered, but I didn’t realize it was pedal powered by longtail cargo bikes! 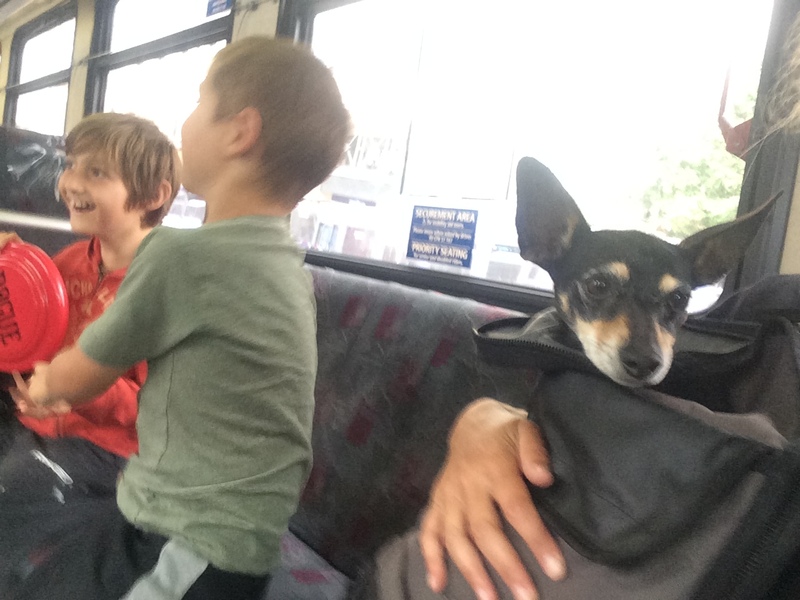 We saw Matt and Omar in the park scoping out performance sites on an Xtracycle FreeRadical conversion and Kona Ute. Most of the bikes are Xtracycle FreeRadical conversions, but there was also one Surly Big Dummy (yay! 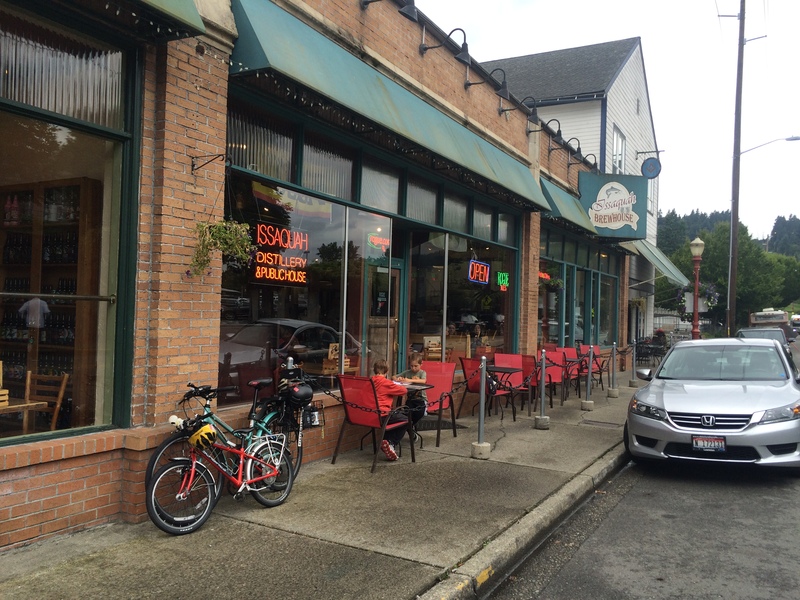 ), a Yuba Boda Boda midtail, a Yuba Spicy Curry (the only e-assisted bike, I think), and at least one regular bike. The show was atop Kite Hill which was the best possible place it could have been! 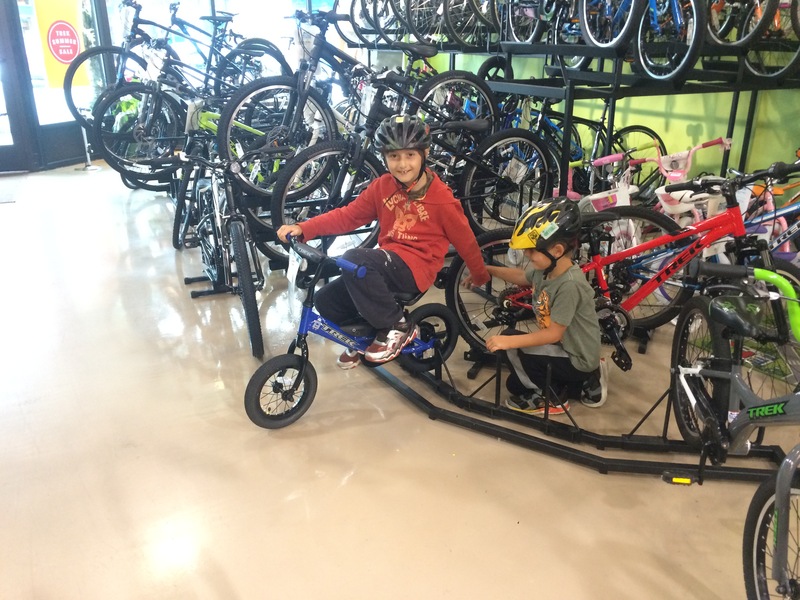 The littler kid tried one of the Xtracycles later, but the top tube proved too uncomfortable. I wish I’d memorized what one of the performers said word-for-word because it was terrific. Similar to what I see on the Band page of Bicicletas Por la Paz: “We bike tour to promote peace, bicycles and empowerment! 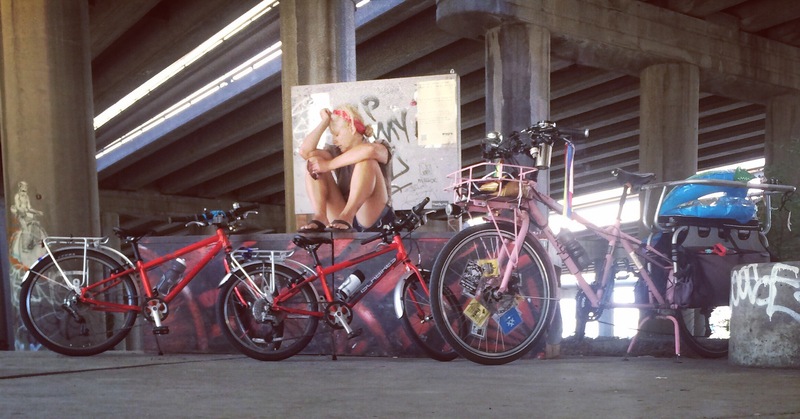 We are working to change the collective consciousness, gearing it towards an alternative form of transportation, using our bodies as the medium.” but there was also something about challenging the idea of inconvenience of bicycling for a touring band. 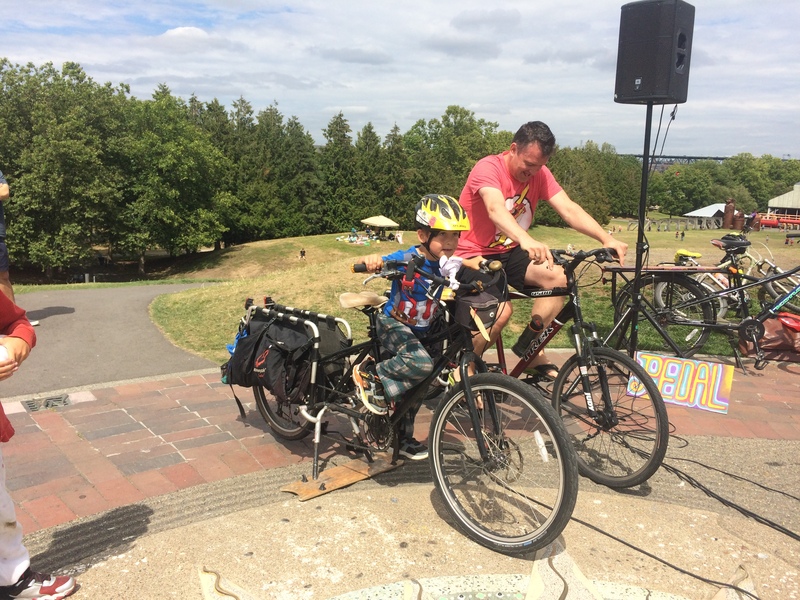 It’s July and that means it’s Seattle’s first FREE BIKE Festival. 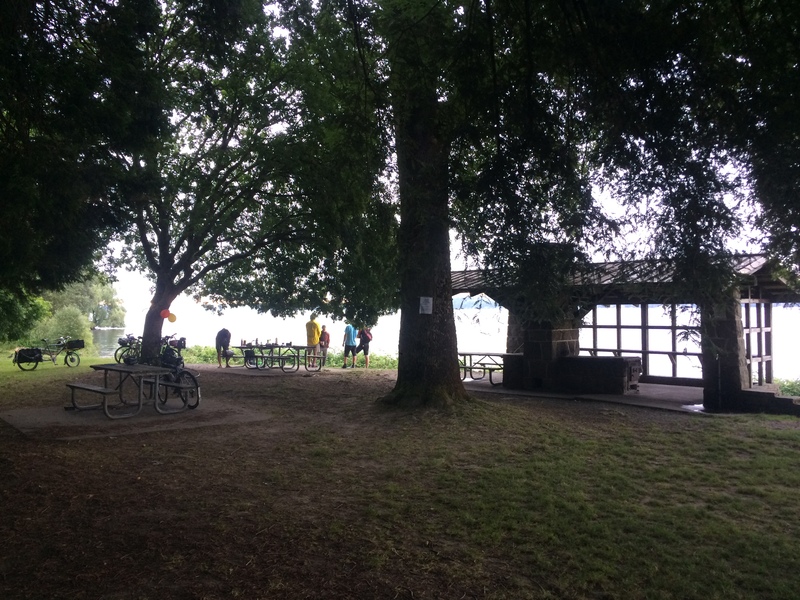 It’s a crowdsourced festival of bike fun, running July 1st through 10th and I’ve put four events on the calendar, including a Sunrise Coffee Club this morning. 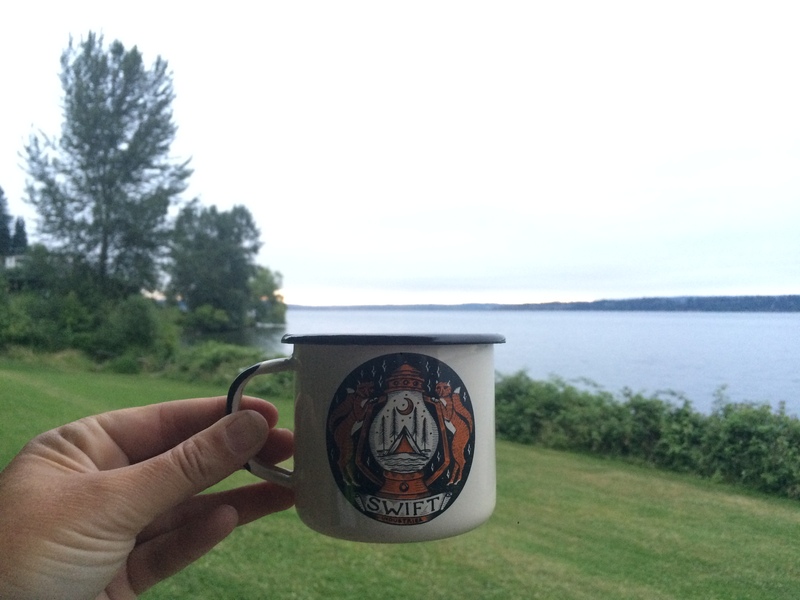 I got up at 3:30 a.m. to leave the house at 4:00 a.m. and get to Madrona Park before 5:00 a.m. since sunrise would happen at 5:16 a.m. I didn’t expect anyone else to show up, but there were eight of us! Thank you to Ian, Anne, Claire, Ryan, Tom, Chris, and Taylor for getting up so early! Unfortunately, there was no dramatic entrance by the sun due to low cloud cover, but it was still a great morning: birds serenaded me the whole ride down, eagles flew back and forth while we sipped our coffee, and Mount Rainier looked pretty as a postcard. 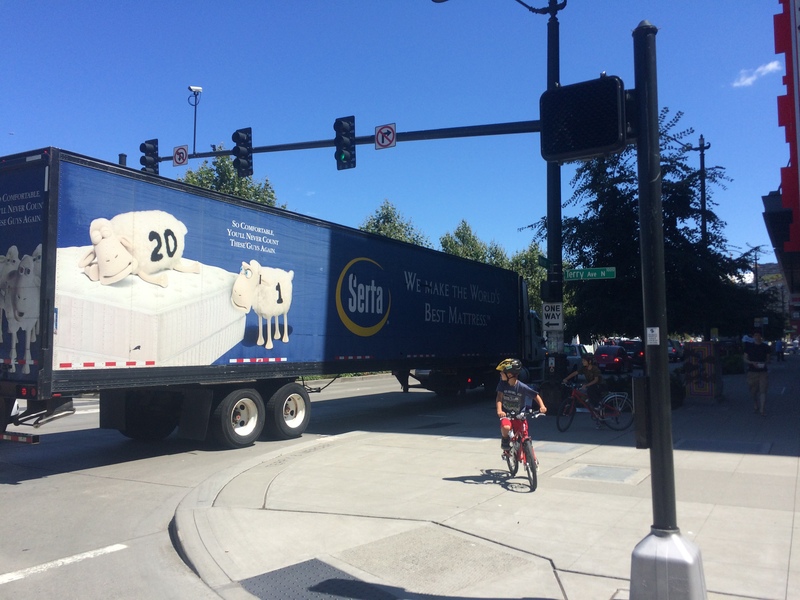 Next up for the festival is the FREE BIKE Kickoff Ride at 6pm, starts at MOHAI, ends at Peddler Brewing Co. I think I’ll try to rally the kids to join. 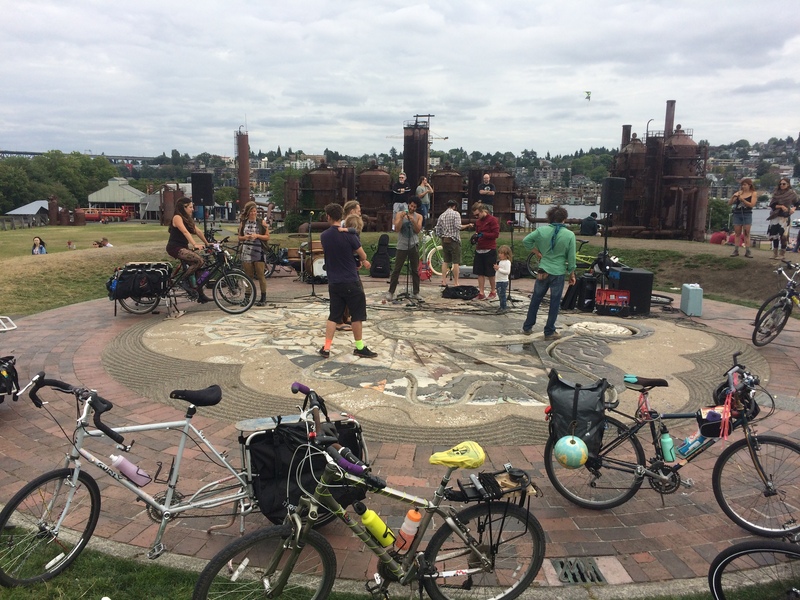 If we can time it right, we’ll play at the Lake Union spray park and South Lake Union beach all afternoon until the start of the ride and join for the first half, but peel off to the east when the pack heads west.